Chad Sparber has been an assistant professor of economics at Colgate University in Hamilton, New York since 2006. Prior to that, he earned his BA in economics at Western Washington University and his PhD at the University of California – Davis. His initial research examined the macroeconomic costs and benefits of racial diversity, concentrating on the US experience. More recently, he has been studying how native-born workers respond to immigration through their occupational and internal migration decisions. His research on these topics has been published in American Economic Journal: Applied Economics, Journal of Development Economics, Southern Economic Journal, and Regional Studies. 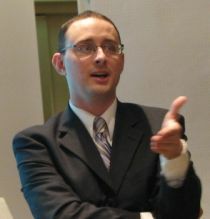 Chad Sparber joined CReAM as an external fellow in May 2009.